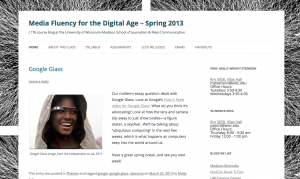 In the School of Journalism & Mass Communication at the University of Wisconsin-Madison, I teach digital studies courses and am the faculty member representative for the Digital Studies Certificate. Undergraduate topics course, 3 credits, 16 students, 2x per week. What does information have to do with landscape, and what does media have to do with architecture? These days, everything. Information bleeds into the environment around us, multiplied by screens of every shape and size, replicated and reverberated by our personal social networks and amplified by digital connections. 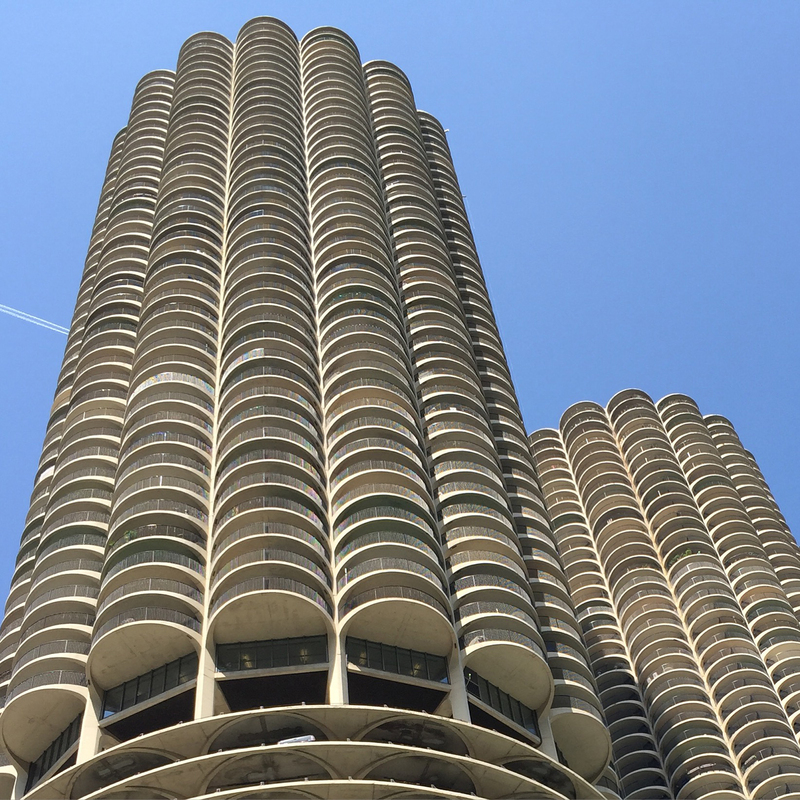 Where in the digital world, we tend not to blink when we hear the words “information architecture,” what exactly does it mean when technologies of information shape our physical environments? his class is about forging and exploring the connections between the digital and the physical worlds. 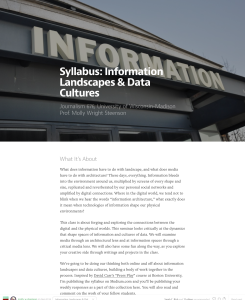 This seminar looks critically at the dynamics that shape spaces of information and cultures of data. We will examine media through an architectural lens and at information spaces through a critical media lens. We will also have some fun along the way, as you explore your creative side through writings and projects in the class. 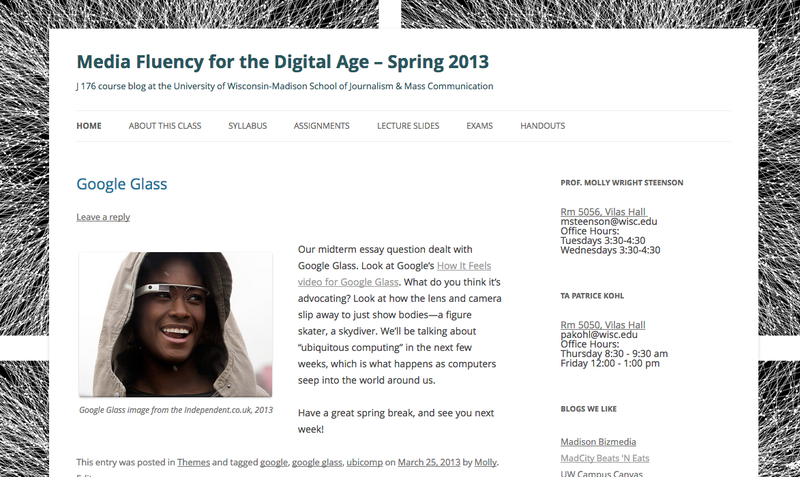 This class used Medium.com to publish its syllabus and the writings of the students, many of which were extraordinary. Information Landscapes is my favorite class I’ve ever taught. Undergraduate lecture course, 4 credits, fulfills Communication B (extended writing & public speaking) requirement. 330–400 students, 3x per week. The goal of this course is to actively engage with the media landscape—its history and its practice. Students will be able to discuss the key strategies and practices of a number of these areas, including journalism, digital media, strategic communication and media effects. They apply these ideas in speeches and discussion, in short essays and longer analysis pieces that examine current events, the news, political communication, public relations, advertising, social media, theories of media, and digital culture. Undergraduate topics course, 3 credits. Digital media is very much a part of our day-to-day lives. It’s not just a question of what we do online and in the digital world, but how and why. What makes up the ecosystem of media, content, infrastructure and devices? When we are creative online, who benefits? And what does it mean when these interactions we have seep into the world around us—not only on computers, mobile phones and smart phones, but into the world around us? Digital media has a history, and yet things can change at warp speed, over the course of months. In this course, we will try to slow down and examine what makes up a digital media world. We will be analytical and critical about media in the digital age. This 3-credit course, Media Fluency for the Digital Age, is intended for first and second year students but also serves as the School of Journalism and Mass Communication core course for the Digital Studies Certificate program. Undergraduate topics course, 3 credits. I developed the School of Journalism & Mass Communication’s first course on data visualization for journalism students. Students learned critical skills about communicating and narrative with data. They defined data sets, critiqued data visualizations in print and on the web, and created their own projects.